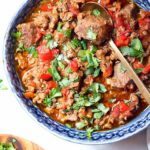 3 meat low carb, keto and paleo chili recipe is so juicy, tender and full of flavor it's all you'll ever want for dinner! Perfect to make on the stove, in the crockpot or instant pot! Add oil to large saucepan over medium heat. Once shimmering, add onion, bell peppers, and jalapeno. Cook until soft, about 10 minutes. Add garlic and give it all a stir, cook until garlic is fragrant, about 2 minutes. Once cooked, place all veggies on a large plate and set aside. Crank up the heat to high in the saucepan, and add the boneless chuck to brown. Rotate with tongs as you brown each side. Set aside on the plate with the veggies. Add ground beef and sausage to pan in batches so as not to crowd the pan. Brown evenly. Add cumin, paprika, oregano, salt and pepper and stir together for about 1 minutes, or until the spices are fragrant. Add petite diced tomatoes, chicken broth and sauteed veggies and any meat you removed from the pan. Stir to combine. Bring chili to a simmer, and simmer uncovered for 1hr 45 - 2 hrs, or until your chili has reached your desired consistency. Serve warm with cilantro, salsa or jalapenos and enjoy! The nutritional information is based on 1 bowl of chili if you divide this chili into 8 bowls. The exact measurement of this will vary depending on how much liquid you cook out of the soup, I was able to make 8 cups of chili using this recipe, so 1 serving would equal 1 cup. If cooking in the crockpot, place your cooked ingredients in your slow cooker and turn it on low for 6-7 hours. You'll know the chili is done when it has reached your desired consistency.